There has for many years been a local hang-out, a place where folks can go to talk about the news of the day over a cup of coffee or the teens can go to hang out and talk about the latest school drama. In the early days, this was likely at a lodge meeting or the barbershop, or at a school picnic or other function. As Bentonville progressed from a small hamlet into a city, these spots became more numerous and more associated with food. Originally, the main hotel in town was the only place to get a meal that wasn’t from your own kitchen. During the Civil War, that spot was the Eagle Hotel. As we know from historical records that Gen. Sigel was there eating breakfast when he was nearly surrounded by the Confederate forces that chased him all the way to Sugar Creek before he finally received reinforcements. Cafes became more prevalent with the advent of the automobile. There were a few small restaurants around the square prior to 1900, such as the Log Cabin, The Star, and The New Racket. These primarily served as a breakfast and cup of coffee in the morning and a quick lunch for the downtown business people. After the turn of the century the number of cafes in town exceeds my ability to find them all. Red’s Chili Parlor was one of the more popular in 1930 and was located on South Main. Red Cavness was the proprietor, and his daughter Janie Hall tells me that there were four or five stools for customers and her mom made fresh pies in the back. Red was such a leading citizen that he deserves his own article – he ended up serving as fireman, councilman and mayor during his long life. His father Henry had also run a restaurant in Bentonville. By the 1940’s, restaurants and cafes were everywhere. Before air conditioning, it was a treat for mom to escape the hot kitchen every now and again for a home cooked meal somewhere else. One of the most popular spots, and one that even today’s older readers might recognize, was the Horseshoe Café. Located at 107 West Central, they were in the best spot for downtown eats. 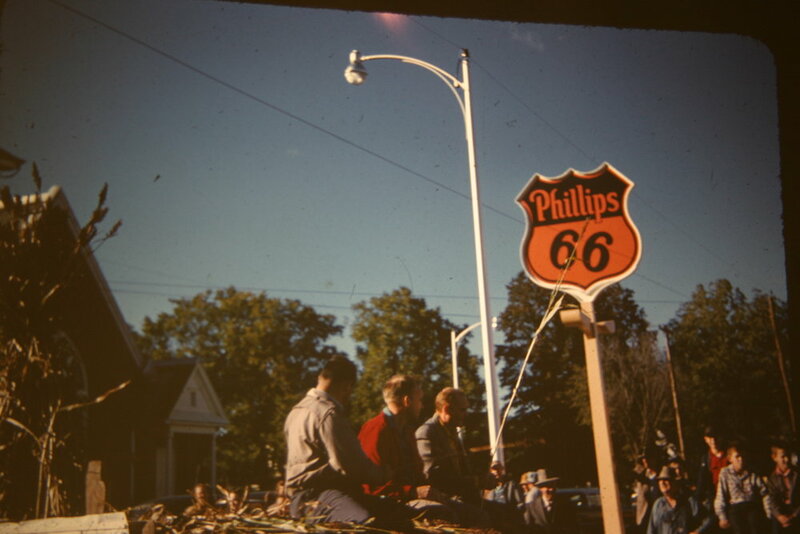 By the 1950’s there were more restaurants along State Highway 71 which ran through the middle of town. South of town, the Rainbow Curve area was more of a crossroads than a curve. 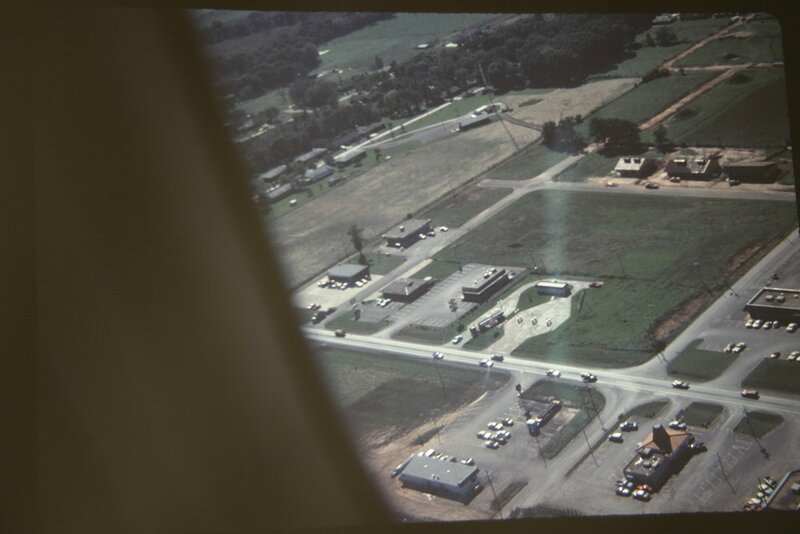 The Rainbow Drive-in and the Plantation were located there. The Rainbow was on the west side of what is now Walton back when it was considered out of town. 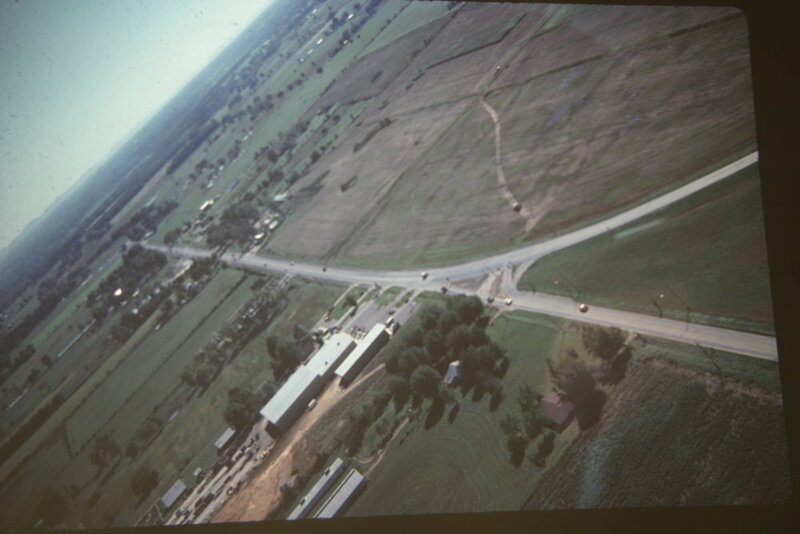 The Plantation was south of the curve, near the intersection of both Hwy 71 and Hwy 12. Featherston’s Café was at 710 South Main, Hazel’s Café was at 117 South Main. The 71 Drive-In was at 704 SW A, the Plaza Grill at 126 West Central, and Stephen’s Café was at 707 SE 5th. The list gets longer and longer with each passing year, with restaurants starting business and ending business often within a short time of each other. 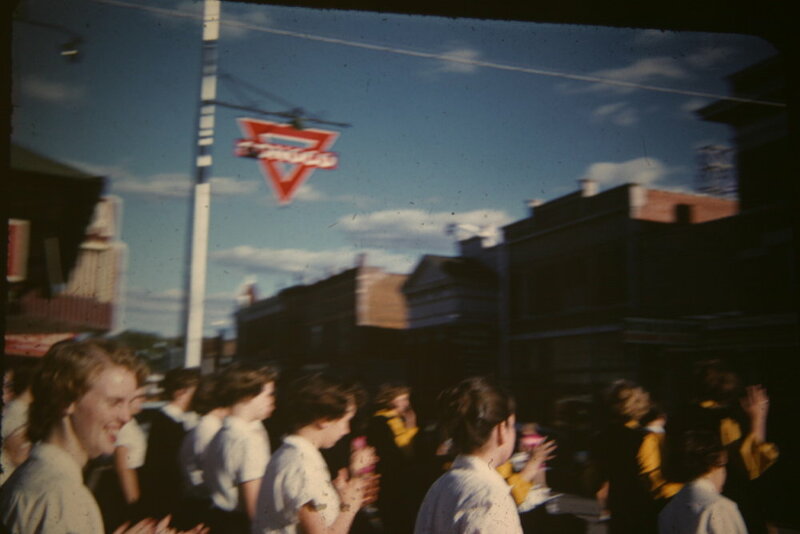 The teen gathering place in the 1940’s and 50’s was the local soda fountain. My mother and her best friend Marilyn both worked at the Crow Drug Store on West Central. There was also the Corner Drug and Applegate’s. They all had soda fountains and the kids hung out there after school, so if you worked there, you saw everybody you knew. In high school my mom wrote a little article for the paper about the ‘teen scene” and I don’t wonder where she got her information. News was a little slower back then I guess. By the 1960’s and 1970’s nearly every teen had a car, so the local drive-in was the hot spot. All I have to do to a middle-aged Bentonville native is to mention “Dairy-O” or “Virgie’s” and their eyes glaze over with memory. Virgie’s was on 71 just north of the Peel House. 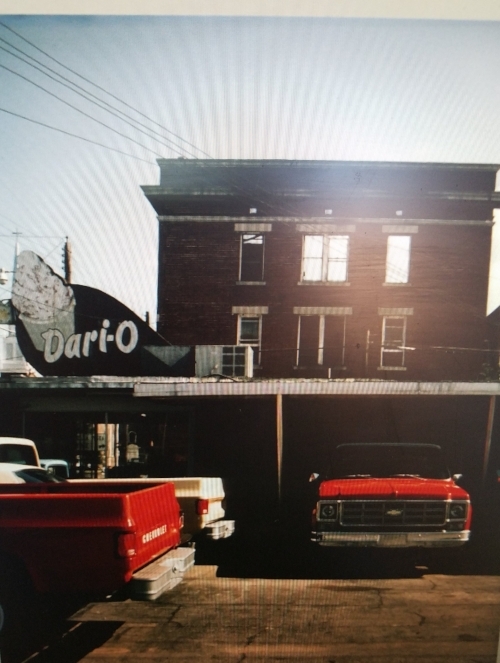 The Dairy-O was right behind the Massey Hotel and was the main downtown hang-out. I’ll never forget the last day of school back in the late 60’s when our ancient bus driver Chester Douglas skipped the usual route home and took the bus to the Dairy-O, opened a fresh roll of dimes and gave every rider 10 cents to buy whatever it would buy. I think it was soft-serve ice cream for me. 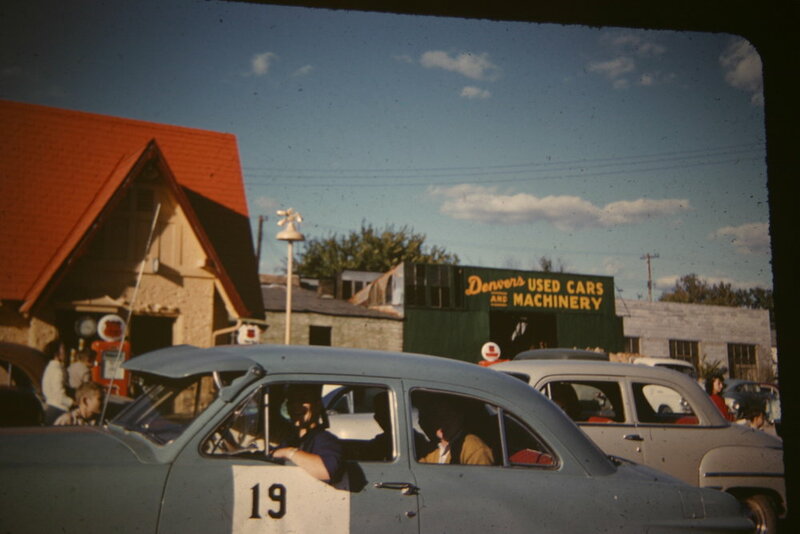 If you travelled out of town, you always knew where the best drive-ins were. We all remember going to Rogers and the Besi-Dream or Susie-Q, which is still in business and really is largely the same as it was in 1965. I don’t remember Springdale as well, because if we went past Rogers, it was usually to Campbell-Bell on the Fayetteville square or Evelyn Hills shopping center for school clothes. We all remember the Minute-Man drive-in just up the road from the old Washington Regional Hospital. It’s funny how we remember certain places and things. Remember when having a soda pop was a treat? I think the smell of food and the excitement of being somewhere besides home causes us to have a little memory bookmark, associated with friends and family and really good hamburgers. - Ok, what the heck? Spooks in the cave? There is some conjecture that someone was breaking in to steal onyx which was found in the cave, but still, pounding in the middle of the night? That would be creepy to say the least. - That’s kinda cool, an exploding meteor. I wonder where it went? Maybe they named the Meteor Theater after they saw it? More information please. - I guess that’s one way to do it. I wonder, though, how can they tell if they are Bentonville flies? Maybe they are Rogers flies that have been snuck in to add to the count? - That’s short and sweet. But what? Sneak thieves? When’s the last time you heard that? According to Merriam-Webster, a sneak thief is someone who steals whatever is readily available without breaking and entering. But surely there is more to this story – like where or what was stolen. Whatever. Just be on the lookout I guess. - This story begs for more detail. How exactly did a woman fall from the balcony? Was alcohol involved? What happened to her? They leave you wanting more information on this one for sure. Lola Smith was probably someone’s great grandmother. This may be the first they’ve heard of it. - Ah, the deranged teacher. This could have been any time, including today. I know it could have been when I was in school. Poor teachers, cut them some slack. Immediately remanded to the state mental hospital? Wow, that’s harsh. - First the teachers, now the kids! 14 years old and in jail for not answering the jury. Again, sounds a little harsh. I’d like to know more, wouldn’t you? I wonder what they were asking her? There’s no follow up, so it’s lost to history I guess. - This just sounds made up. A chicken with teeth and a head like a dog? Oddly enough there is a genetic mutation that causes a chicken to grow teeth and have an abnormal shape. This was what led scientists to believe birds were descended from dinosaurs, like in Jurassic Park. - Mules for Africa. Hmmm. Well, the Boer War was going on in South Africa in 1900 so maybe they needed mules. But from Bentonville? Weren’t there any mules closer than 8800 miles? Weird to say the least. - This is the creepiest. Just a skull, they say, no body or anything. I want to know where!... And it’s not like it was front page news, just a little blurb, like – Is anyone missing a HUMAN SKULL? Nobody? I wonder what they did with it? I’ll be here, begging for the details. The Bentonville Interurban was a fascinating part of Bentonville history and was a unique slice of time gone by. As many of you may know, Bentonville was missed by the Frisco line that ran from Missouri to Fayetteville and southward in 1881, but leading citizens paid to have a branch line run to Bentonville in 1882 to supply its residents with passenger access and those in the apple industry a means to transport goods outside of our area. Talks had been underway for a rail access directly to Bentonville as early as the 1850’s but the Civil War halted all activity until after the war. By the early 1900’s the railroad line was doing a booming business, and small community interurban passenger trains were all the rage. Several cities in Arkansas operated these types of trains or their close kin, overhead electric trolley systems. Discussions had occurred as early as 1909 concerning the operation of an interurban, and originally plans were to run the line from Joplin to Bentonville. Along the way, other towns were willing to pay to take part in the service. Eventually even Gentry, Siloam Springs and Tontitown expressed interest in running the line to their towns too, but in the end the interurban was a Rogers to Bentonville service only. Funding was secured, surveys were made, and the extension of the main line was completed for a grand opening on July 1, 1914. The interurban line left the Bentonville Branch line of the Frisco at SW A Street, running straight up the middle of the street north to a stop at the Massey Hotel. The line ended at the Park Springs Hotel, where there was a storage barn for the trolley. This allowed tourists to come straight to the hotel of their choosing. Also large crowds were brought in for city picnics and ballgames, as the Park Springs Park and the adjacent Blackjack ball park were conveniently at the end of the line. All went relatively well, barring the occasional derailment or breakdown, until June 1916, when the Frisco raised the rent for use of their line between Bentonville and Rogers, and the interurban was discontinued. An attempt was made in 1917 to revitalize the line but it failed. After the line was discontinued, the tracks were taken up on A Street but not without problems. The city eventually had to pay some of the land owners along the tracks for damages caused by them. But it was a great idea, wasn’t it? The James Gang in Bentonville? Charley Craig and Charley Clark sleep at the store. It was 8 o'clock at night...the two men were sitting by the stove, cooking some eggs, when the door opened and two men entered and took seats by them. This was such a common occurrence that it did not worry the boys. Directly, the door opened again, and in stepped two more men; as they entered the store, the two sitting by the boys, quick as lightning, put pistols to their heads, threatening their lives if they moved or uttered a word. The third watched the door while the fourth ransacked the store, doing the stealing. He literally "went through" the store, stealing all of the money he could find. He took a suit of clothes, the very best in the store, for each of the party, ordered Charley Clark to take off his boots and, when he found they did not fit, ordered Charley Craig to do the same...and left the young man bootless. The boys had to give up their gold shirt buttons and permit themselves to be searched for other valuables. 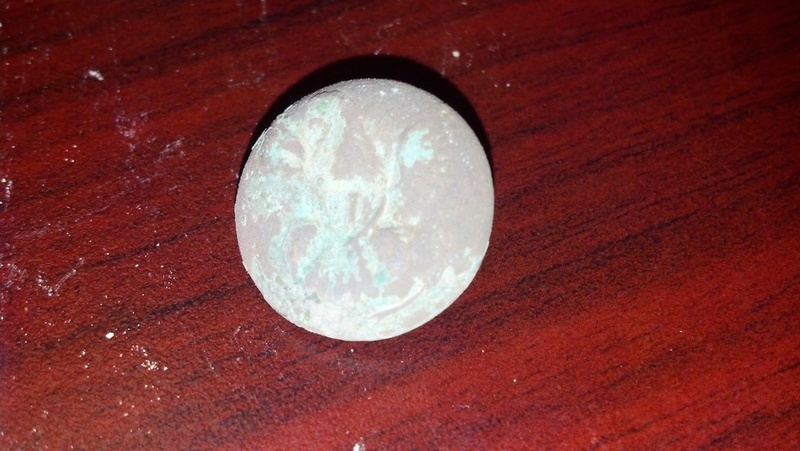 After they had stolen all they wanted, they tied the boys and made their way to the street....so ended one of the boldest robberies ever perpetrated in this part of the state..."
This is one of my favorite items that I have found. I found it an old abandoned house when I was a teen, about 1977. The house was falling in and I was exploring, like I shouldn't have been . Anyway, it's a post card from the Bentonville Weather Bureau dated November 28, 1924. They evidently sent post cards out to whomever requested it, giving the weather forecast for a day or two at a time. As you may or may not know, Bentonville was the smallest town in the United States to have a First Order Weather Bureau. It was provided through the help of native son and US Senator James H. Berry, and was a testament to the huge impact the Benton County apple market had on the United States as a whole. It was in operation until 1942 and was located on the northeast corner of NE 2nd and A. To my knowledge, this post card is the only one like it still in existence, as they were normally thrown away nearly as soon as they were received. "A herd of 365 cattle passed through the streets of Bentonville Wednesday. They were being driven from the eastern part of the county to the Indian Territory." Can you imagine 365 head of cattle passing through Bentonville today? They would almost cause as much problem with traffic as shutting down every street across town has in 2017. As you know from reading my website, I was once a fireman. I started that career many years ago in the early 1980's. In the last few of months I have lost a couple of friends from that earlier time that I believe are worth mentioning. Leon Reece died in November, 2016. He was only 72 years old. He was a fireman for about 26 years I think. He was one of the first two paramedics that Bentonville had. At that time, every time there was an ambulance call, either he or the other medic had to meet the ambulance if one of them wasn't already on it. That lasted about a year. Leon was promoted to fire chief in about 1987 when Chief Jerry Griffith retired. He served in that position until his retirement in 1999. Leon played in a local band called the UpTights. They were pretty good for Bentonville 1960's standards, and they continued to play for many years, often to the old Bentonville High School alumni crowd, who really appreciated them the most. As Leon often said, " We aren't very good, but we sure are loud." Leon was what is known as "a good old boy." He liked to hunt but from what I hear, he especially enjoyed being the camp cook at deer camp every year. Then within a few months, another friend gone. Bobby Joe Elsea died in February. Bobby Joe was only 70. Although he was a few years older than me, we both went to paramedic school at Springdale Hospital in 1986 and 1987. If you looked up "laid back" in the dictionary, I'm sure Bob's picture would be there. He was the very definition of the term. Bob was nearly always seen with a Marlboro 100 hanging from his lips and his glass of sweet tea. Although Bob tried to burn me up one time and drown me a second (email me for the details) I don't think I ever saw him lose his temper. He served for 20 years before medical troubles caused him to bow out of the career he loved so much. Both Leon and Bob had long careers with the Arkansas National Guard, Battery B, 1st Battalion, 142nd Field Artillery. I know a lot of people won't know them and won't remember them once they have faded from memory. But they meant a lot to this community while they were here, and that's something we should never forget. They served in the military locally, with the fire department in our city, and as paramedics for our ambulance service giving comfort to the sick and injured. I know I won't forget. I'll sit on the curb and cheer the true heroes in our lives - those that help and protect us here, in Bentonville. I am going to handle a hot potato and try not to get burned. I have a lot of people come to this site wanting to know about the Confederate Statue on the Bentonville Square. No one has dealt with the history of the statue or at least have deat with it at the bare minimum and it needs to be addressed. In no way does this blog attempt to make apologies for slave owners for the way they treated African American slaves in the 1800's. Slavery was a failing if not failed institution by the time of the Civil War and was hotly debated at even the time of the signing of the American Declaration of Independence 90 years earlier. I am humbled by the experiences that slaves endured throughout slavery as I hope everyone is. Looking at it in hindsight without putting yourself in the actual position of the slaves and slave owners is difficult to do, as none of us will ever really be able to "know what it's like." Especially helpful is a reading of slave narratives taken by the WPA in the 1940's. I am much more sickened by the treatment of African Americans in the South after the war, especially in the 1950's and 1960's, as that era is more familiar to me. I hope that relations between all races continues to get better and better instead of what appears to be a worsening situation in many areas today. Fortunately, Northwest Arkansas has sped ahead of many areas in their treatment of different cultures and races. My fervent home is that it stays this way. I have had a few nasty comments about the statue and the backwardness that it represents and have been called a few names, although I have nothing to do with the statue or the history in general. I have had a search of my site recently by someone who wondered who the statue in the middle of the square was supposed to be. The statue is a figural respresentation of the Confederate Soldier. The history behind the statue is part of what makes Bentonville unique. The only Arkansas Governor from Bentonville was James H. Berry who served as a lawyer in Bentonville, was elected to state legislature in 1872 and speaker of the house in 1874. He was a circuit judge here from 1878 to 1882. He was elected governor in 1882 and served from January 1883 to January 1885. He was appointed to the United States Senate in 1885 and served there until 1907. Berry was a Confederate and served as a 2nd Lieutenant and was wounded in Corith, Mississippi and lost a leg. Andrew J. Bates was born near Dadeville, Missouri in 1844. He fought for the Confederacy, joining the Arkansas 26th Infantry, Company “K.” He never rose above the rank of private. In 1866, Bates came to Benton County. He was a founder of the Benton County Bank, along with Col. W. A. Terry and S. F. Stahl, where he served as vice-president. He sold his interest in that bank and organized the First National Bank of Bentonville, of which he was president until 1920. He was a well known elk and big game hunter. 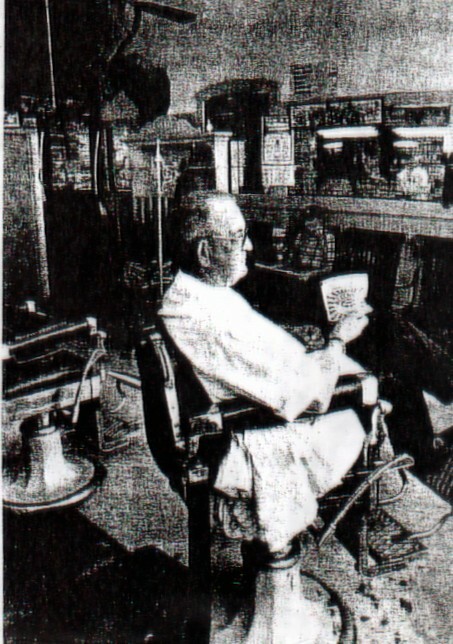 His many hunting trophies added flavor to the Elk Horn Barber Shop. Bates died in 1928 and left an estate of $150,000. At his wife’s death, the remainder of the estate was to be used to build and maintain a hospital, to be known as Bates Memorial. After a challenge to the will by Bates’ nieces and nephews, and the loss of $52,000 in worthless stock, the remainder was matched by the WPA. In 1935 the twelve bed hospital was completed at a cost of $18,000. So anyway, Bates wanted to make a gift to the city to memorialize the Confederate soldiers who had served from Benton County and Bentonville in particular. Statues of this sort are common throughout the south. 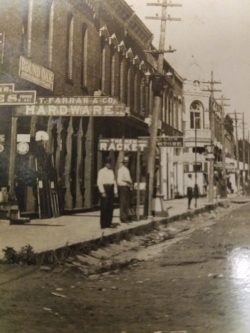 If you are familiar with Bentonville history, the town was nearly completely burned by the Union Army during the Civil War and many of the local boys fought for the south. The statue was dedicated in a grand ceremony on August 8th, 1908. One side of the base reads, "To the Southern Soldiers - Erected by A.J. Bates and the James H. Berry Chapter United Daughters of the Confederacy Aug. 8, 1908." The other reads, " Their Names are Borne On Honors Shield. Their Record Is With God. They Fought For Home and Fatherland." There have been attempts made a few times over the past fifty years to have the statue removed because of the pain that the Civil War caused on both sides; however, the center of the square was deeded to the Daughters of the Confederacy for use as a park to be known as Public Square Park and will remain in their possession in perpetuity. Benton County was never a large slave holding county in Arkansas. Most of the slave owners were failures at business in other places and started anew here, bringing their slaves with them. The 1850 census shows Benton County with 3710 population and 209 slaves. By 1860, the population had grown by nearly tripled to 9306 but the slave population was only 384, growth that was less than doubled. The soldiers from Benton County were about 1100 total. Of those, about 51 deserted from the 15th Arkansas Infantry Northwest alone; 43 were killed or sick. Company F was hit hardest, with 7 desertions, 20 killed or ill, and 45 captured. If you read in-depth of the history of our county and especially the history of our town, the treatment of African Americans, while not execllent, was better than most southern cities. Bentonville never had "sundown"laws to my knowledge, and I have done extensive research. "Well, I'm sorry my son, but you're too late in asking Mister Peabody's coal train has hauled it away"
Just five miles away from wherever I am"
This song reminds me strongly of the Ozarks and of how fortunate we all are that our progress has been "constructive" instead of "destructive." Do you remember going out with your dad or brothers and shooting at pop bottles? The line that, "the air smelled like snakes" isn't that the humid summer feeling we all get when we are lazing about the yard or along the creek, watching for the water moccasins and copperheads? Finally, the last stanza reminds me of Mill Dam, which was the local swimming hole for many years off Regional Airport Blvd, where the Osage rolled over the old mill dam and created a pool perfect for swimming and sunning. There was a low water bridge there (read "no bridge" if you aren't from the Ozarks) which was replaced a couple of years ago by a regular boring bridge. You used to be able to drive down the road in the summer and drive right through the Osage to continue on down the road and see the locals lounging around in the water, the kids playing in the pool, sunning on the big limestone dam. Back in OUR Paradise, just five miles away from wherever we are. I was thinking a little bit earlier about how times have changed, just over the last tewnty five years. In one of the many previous jobs I have done was that of water pump service man. I have worked since I was a child. That's not a boast, it's a fact. Work was expected around the farm as there were many things to be done and I had it easier than a lot of my friends. My dad owned a livestock auction, so we were always feeding, sorting, and loading out for sale. The first time I drove the pick-up while dad fed hay from the back I was five years old and living in Sugar Creek valley on 417 acres. Dad put the truck in low and told me to steer. I was terrified. Lots of my friends did real work, on large dairy farms where they worked from sun up to sun down. I had it easy in comparison. I worked at the livestock auction from childhood until I was 14 or so when I went to work for my step father, Bob Harbit, at Northwest Pump. And I have told you all that to tell you this. Over the course of several years in the pump business I ran into a couple of people who remind me now of what farming and work was really like. Pump work is hard work, hot and thirsty in the summer and freezing in the winter. Never any water to drink unless you brought your own. But I remember a couple of people who knew what it was like to work. The first was Roy and Ruth Elzey who had a place out toward Beaver Lake. Mr. Elzey was an old Bentonville contractor and the father of two Bentonville Fire Department retirees and the grandfather of one retiree and one who still works here today. When we were in the middle of pulling the pump to correct whatever was wrong down in the well, Mr. Elzey stopped us midway for sandwiches. Now tell me, when you call the plumber today or have your roof replaced on your house do you stop the workers halfway through for snacks? I didn't think so. I usually don't think about it either. But Roy did. He knew what it was like to work all day in the hot sun. I won't ever forget the hospitality. The other time was when Bob and I were working for Mrs. Inlow in Cave Springs. She was the mother of Charles Inlow, one of the first cardiologists in Northwest Arkansas and a student of my grandmother's at Cave Springs Elementary School back in the 50's. Tragically, cancer took this brilliant doctor in 2009. But back to the story. Halfway through the job we were stopped by Mrs. Inlow for lunch. Forced. There was no way to say no. This was how it was going to be. When we cleaned up a little and went into her kitchen she had laid out a spread fit for a Sunday dinner. There was virtually everything you could think of - the table was covered with all sorts of food. Do you remember when you used to go to your grandmother's or great-grandmother's for a visit on Sunday and piles of food would appear as if by magic? How did they do it? I'm lucky if the peanut butter at my house is fresh, yet here it was. Everything. Mrs. Inlow was raised on a farm I'm sure and had her own farm for years. She knew what it was like to work all day and she was prepared to feed the workers just like she had her entire life. Second nature. I will never forget these two thoughtful people who remembered what real work was like in a world where most people don't give the working man a second glance. The title was brought back to me a little while ago when I was sitting outside and heard the local Arkansas and Missouri freight train blowing it's whistle frequently as it came into Bentonville. They have some box cars on the siding at SE 8th where the track now ends and also deliver sand to the local concrete company and, as they do, blow the whistle at every intersection every time they move back and forth into the city. The old line used to run from where it stops now, down towards SE J Street next to the old Wal-Mart Warehouse #2 which is now the return center and sample store. It angled Northwest to near SE D and 4th past the old Ice House and where the Eagle Mill once stood. There was a siding there that veered north and then made a dead end where the city shop is now at SE 3rd and D. There was an apple evaporator there years ago, when apple was king of Benton County, and when they added onto the shop, they found a large diameter pipe that ran north to parts unknown. My guess was that it ran downhill to the "Largest Brandy Distillery West of the Mississippi" at Old Wayne Road and NE 2nd so that apple squeezin's (an Ozark term for sure) could be flowed in to be made into brandy. From SE D and 4th the line ran west past the Farmer's Co-Op and the depot at South Main then continued west and then slightly southwest past (or maybe even through) what is now the Wal-Mart Home Office, continuing southwest and then west about 150 yards north of Highway 102 toward Centerton and westward. The pictures of this old rail bed are elsewhere on this site. Back to the original thought - the phrase "When the Whistles Blew" is located in J. Dickson Black's History of Benton County, heading a hand drawn map of Benton County rail lines drawn by Clarence A. Harris in 1964. Railroads have always fascinated me. It is difficult to understand today what an impact these trains had around the turn of the century in our area. They were, for the day, unbelievably powerful, fast, and especially, loud. There was nothing like it - a humongous piece of machinery that could move faster than anything anyone had seen. "During the early part of this century when railroading was at its peak, the Frisco daily ran two fast trains through the Ozarks. The only stop these fast passenger trains made between Fayetteville and Van Buren was at Winslow. Through all the other small villages along the route (which came into the county where it does now at Gateway on it's way south to Fayetteville) they travelled at such terrific speed that they were called by local residents 'The Cannonballs.' They stopped for absolutely nothing. Children were cautioned to be wary of crossing the tracks when these trains were due. They went so fast that an unwary child caught on the tracks as the train approached would only have seconds to get out of the way. Very little persuasion was needed to make children aware of the danger. Stock was allowed free range and often cows, horses, pigs, and household pets met their death under the grinding wheels of these 'Cannonballs.' The sight of an animal being crushed and its bloody carcass dragged along the track was enough to fill the most daring child with the dread of the swift moving locomotives." Porter (later Schaberg) in northern Crawford County seemed to fall victim to more than its share of these grisly accidents. Situated as it was in the narrow valley with a long stretch of track dividing the town, the place was especially vulnerable. One mile north of the crossing at Porter stood the 'whistling post.' When a train approaching from the north reached the post, its engineer blew a long doleful whistle. With this signal, travelling at a speed of sixty miles an hour, the train was through town in less than a minute. A series of short, sharp blasts from the whistle alerted all within earshot that some living creature was on the track. Most animals thus caught moved too slowly to escape, even if they were frightened enough by the whistle to attempt a run." Thanks to Robert Winn for that perfect description. While reviewing the Obituaries of Benton County between 1888 and 1935 (available on CD from the Benton County Historical Society) one can see many instances of death by train. Most were from railroad workers who were unlucky enough to fall between the cars while trying to set a brake, pin a coupling, or just losing balance. There were several horrendous wrecks involving vehicles, including one particularly nasty one in Lowell involving the train and a gasoline truck. But in several instances, the train just ran over some innocent person wandering along the track headed for home or town, overtaken by the fastest machine on wheels. There are even a few instances of bodies being found alongside the track that remained unidentified and unclaimed, usually tramps or hobos who lost their balance while riding the rails. The last legal hanging held in Bentonville turned out to be the biggest get-together the county had ever had to that date. Many people started to town the day beforee, so they would be there in time for the hanging. By daylight of January 14th, 1876, there was a big crowd in town. The stores all opened early and did a good business. The excitement all started on August 4th, 1875, when Columbus Hancock was found murdered near his home in White Hollow near White River in Benton County. Sheriff J.H. McClinton soon arrested cornelius Hammon and Grisham P. Hoyt. They were indicted for the murder of Handcock. The both pleaded not guilty. Hoytt asked for a changed of venue and was later tried in Washington County and found not guilty. Hammon was tried in Bentonville in October, 1875. The courthouse had been in use only about a year, and this was the first big trial to take place in it. People filled the courtroom and the halls for the trial. Col. Sam Peel was the prosecuting attorney and John M. Peel represented the defense. They were both well known attorneys. The trial didn't last very long, and the jury was out a very short time. John W. Floyd was the foreman of the jury. They returned a verdict saying, "We the jury find the defendant, Cornelius Hammon, guilty of murder in the first degree as charged by the indictment." Hammon was sentenced bu Judge J.M. Pitman to be hanged by the neck until dead, on the 14th day of January, 1876, between the hours of 10:00 in the morning and 2:00 in the afternoon, at some point selected by Sheriff McClinton within two miles of the courthouse. Hammon was taken from the courthouse in a wagon, riding astride his coffin, at about 10:30 that morning to take his last ride. There was a big crowd at the courthouse, and they followed the wagon out to the scaffold. His last words were, "You are hanging the wrong man," and afterwards some people got to thinking maybe they did, but it was too late. The story of the hanging has been told and retold by those who saw it. They all seemed to think it had been a day well spent. Many of them brought their lunch or bought food at one of the stores. It was one of those warm days in January, so a large number sat down for a picnic lunch not far from the hanging. And many were still in sight of the scaffold on which Hammon had hung. The scaffold stood for over fifty years as a reminder of what took place there but the scaffold and the Razorback Inn are both gone and most of the people have forgotten that there ever was a hanging or a picnic here at one time. But to this day it is not known for sure if they hung the right man or not. Now me - back to the hanging tree, I have never heard of it if there was one. The hangings in Bentonville were few, as evidenced by the one so detailed in the preceding article. I'm sure that there were several cases of frontier justice prior to Bentonville being "civilized" but these have long been forgotten. Benton County - Home of the Big Red...Tobacco Leaf? Most people are aware of what a large part the apple industry played in the development of Benton County and Bentonville...Benton County at the turn of the century had more apple trees than any other county in the United States, we shipped more apples, both fresh and dried, had more evaporators than any other county, and had the largest apple brandy distillery and apple vinegar factory west of the Mississippi. Our apple growers won more awards at the St. Louis and San Francisco Exposition than any other county in the US. But were you aware that before the apple, our county raised the finest award winning tobacco in the country? In the 1880's it was the largest cash crop in the county. Early settlers here from Kentucky are said to have brought the first tobacco seed into the county somewhere around 1833, according to J. Dickson Black. By 1840 tobacco was a cash crop on many farms in the county. The quality was much higher than that being grown in Kentucky at the time. In 1860, 37,725 lbs of top grade tobacco was shipped out of the county. Things slowed down a little during the war, but afterward by 1870 they were growing fields full of Virginia Golden Leaf, White Burley, Yellow Pryor, and Hico Wrapper Leaf. 200,000 lbs were shipped out in 1870 from 547 acres. From 1880 to 1887 the crop ran about 400,000 lbs per year. Bentonville had several tobacco buyers in town and for years Trotter & Wilkes was the biggest tobacco company in Bentonville, and made a full line of tobacco goods sold over six states. In a newspaper article from 1890, it was said that Benton County tobacco was superior to that grown anywhere else in the United States and that we could produce up to 2 million lbs per year. By about 1888 the tobacco industry had begun to fade out as farmers began to cut down on total acres grown. Although Benton County tobacco took first place in the Cotton Exchange Fair in New Orleans in the early 1880's, it soon gave way to the apple industry. I have always said that Benton County was extremely fortunate in that we had fertile ground here on the Ozark Plateau between the Ozarks and the Boston Mountains and we had the ability to bring in top dollar cash crops in the form of tobacco, then apples, then cattle and dairy, then chickens, and then finally Sam Walton arrived and changed history. Isn't that amazing? I wrote my Master's thesis on a Bentonville business, the Elkhorn Barber Shop and the people who worked there and used the shop not only for a shave and a haircut but as the local meeting place. The original shop was on South Main at the back of the People's Bank, but soon moved around the corner to Central, on the south side of the square, where the Chamber of Commerce is now located. It was honestly exactly like this in the late 60's and early 70's...only the people and the cars changed. The main reason I started writing about it was because my grandfather was a barber there for the last few years of a career that started in 1919. He worked in the chair by the window looking out onto the square from 1966 to 1976. "Horton remembers driving to the local picture show in a buggy some fifty years ago (around 1925) because “that was the only transportation I had at the time.” He estimated that during that era a shave cost about fifteen cents and a haircut twenty-five cents. “Times certainly have changed,” the tobacco chewing Hiwasse resident declared, while relaxing in a vacant barber chair at the close of another business day." He died in 2004 at the age of 99, but only after my grandmother, his wife of 73 years, preceded him in death by five weeks. 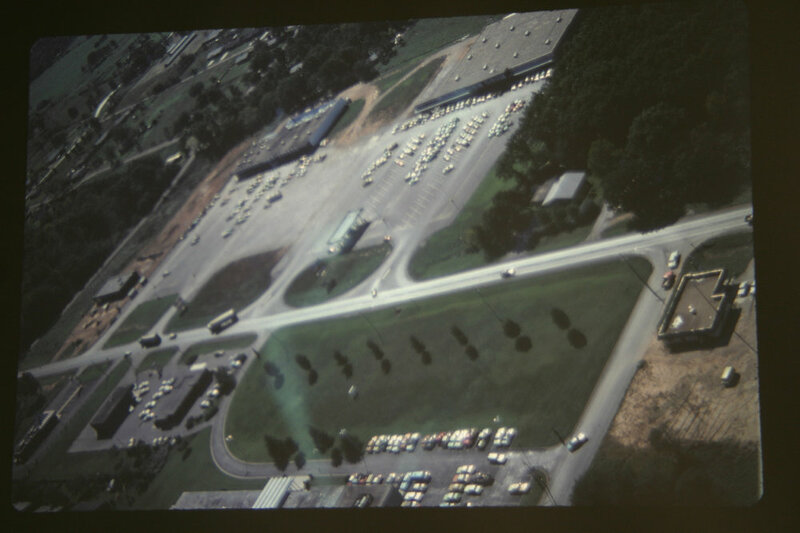 As I was mentioning on the first page of the blog, Mid Town Shopping Center was the hub of activity in the 60's and 70's. I remember when I was young Walton's Department Store was on the west end. When you went in the farthest west door you were walking into sporting goods. Toward the back and then right you went up a ramp and into the dry good part of the store. Of course we went there for everything - cause if they didn't have it, you didn't need it! There were a couple of ladies who worked there - I don't remember their names - but I think they stayed with the company for years and even moved out into the store on North Walton when it was built in the late 70's. 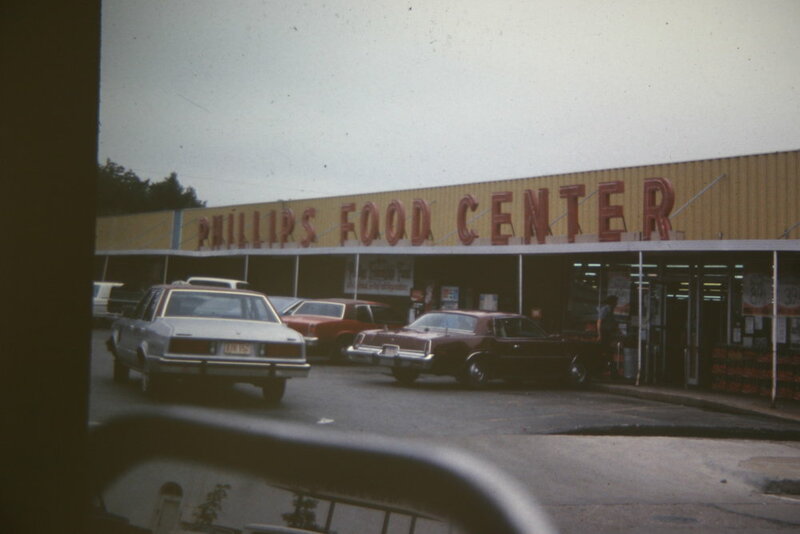 Next door was Phillips Food Center. Harlon Phillips was the owner and he was in the store quite often. He would greet EVERY customer with a "Hi there! how are you today?" It was the same with the employees, as I worked for him when he opened Food 4 Less on North Walton next to Wal-Mart. If someone needed a price check, often Mr. Phillips would know the price off the top of his head. A great guy and a genius of the grocery business. His wife would come in often too and was so elegant. Nice people to work for. In the earlier years there was a restaurant in the back of Phillips. My Aunt Martha used to be a waitress there for a while. I spent a lot of time with my grandmother on NW 2nd street and we rode our bikes all over town, of course, and spent a lot of time in Walton's and Phillips'. Not a great picture, but you get the idea! There was a gas station added out front later. Here's the old Food 4 Less building. The old Kentucky Fried Chicken is in the foreground. 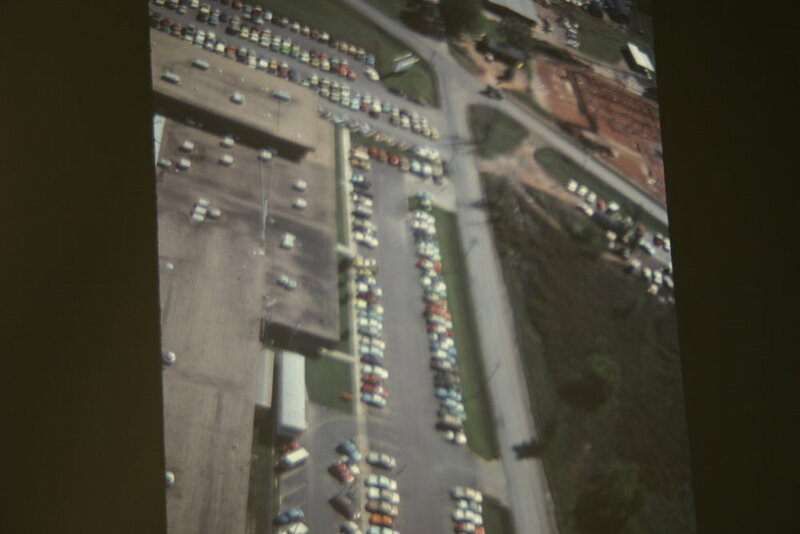 The lot that Mid Town now occupies has been a busy spot for many years. The county courthouse sat on the corner of Main and 2nd in front of the current buildings. 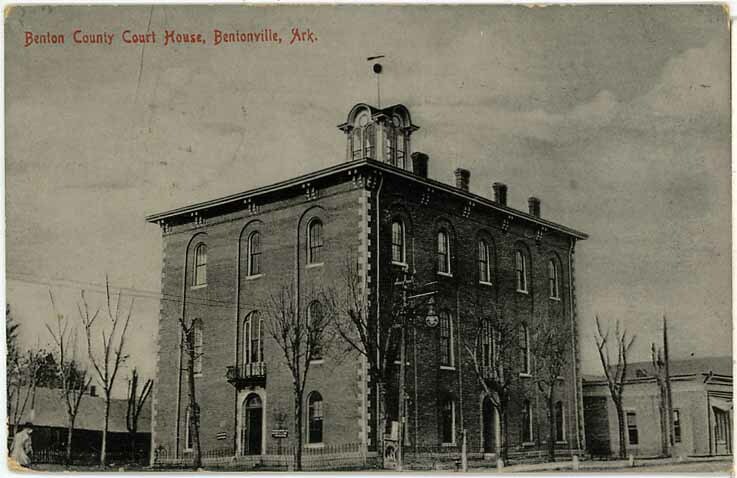 The courthouse was built in 1874, one of the first things we could accomplish after Reconstruction following the Civil War. Later after it was torn down for the "new" court house in 1928, the Hotel Bentonville and the Crosstown Restaurant were on the corner, as was a bus stop. Now we are preparing for the new Harps being built on North Walton and 13th. The old buildings will be torn down to make way for retail shops, a Wal-Mart Neighborhood Market, and a parking garage. Once again Downtown Bentonville will remake itself for the betterment of the community. I had mentioned in an earlier post that General Franz Sigel had been surprised at Bentonville by forces of the Confederate Infantry and Cavalry. Their skirmish took place at the intersection of Sugar Creek and Brush Creek near the bridge on Hwy 72 east. Old Confederate Camp Stephens lay up the Sugar Creek Valley to the east and nearly five miles to the east, the Union Army was entrenched on the north side of Sugar Creek Valley at Brightwater. It was these troops, including Captain Hoffman's Battery and the Fifthteenth Missouri Volunteers who hurried back to assist General Sigel and the Twelfth Missouri, who were under seige by Cavalry led by General James McIntosh and Confederate Infantry under Colonel Gates. I have spent some time recently in that area doing some hillbilly archeology and have turned up a few items from the clash. 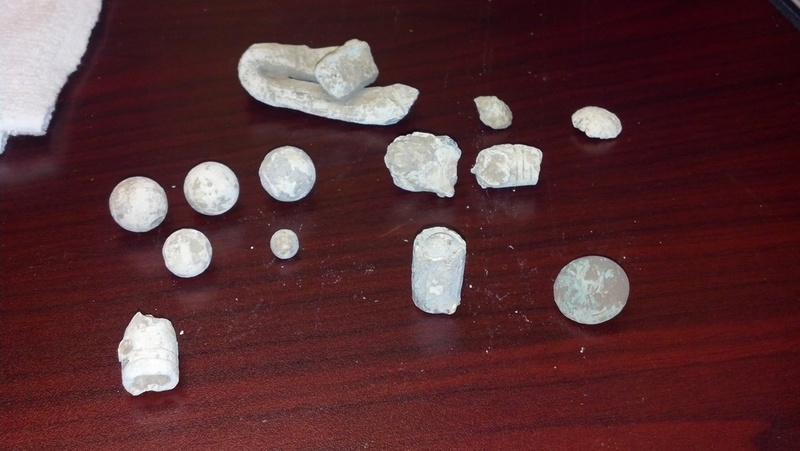 Some nice fired bullets, a lead bar for melting to make bullets, some dropped round balls, and a decent Union Infantry Button. All of these are a little over 150 years old and almost positively traceable back to this exact skirmish. I wanted to talk a little bit about some folks who have mentored me throughout my career and there is no better way to start than to introduce Chief Jerry Griffith. Chief Griffith, or Griff as he was known to his "guys" was put on the fire department on April 18, 1961. He worked as a paid volunteer and his "real" job was working as a printer. During that time, and for many years before, the department had been made up of all volunteers, members of the community who responded to all of the calls in the response area and met twice a month for training meetings and general commentary on whatever was going on in the city at the time. Griff took over as chief of the department from Truman Boling on March 22, 1972. Boling, who had been on the department since April, 1951, was a master builder by trade, and, along with his son Mike who is also a fire departmetn retiree, was instrumental in the building of the fire station that was previously occupied at 215 SW A Street. 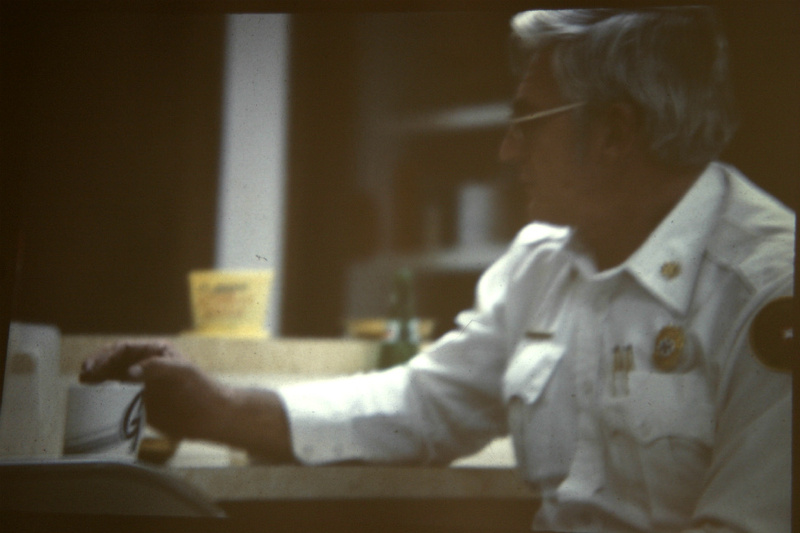 Griff was promoted into a paid position as chief in 1978. This was the first full paid chief position at the City of Bentonville. Griff's most instrumental and lasting effect on the department was the decision to take over the ambulance service when the local funeral home decided to get out of the business, in September 1977. This move, although controversial at the time, allowed the department room to grow and, looking back, was a decision that many fire departments only came to in the 1990's and beyond, finding that housing ambulances in fire houses and cross training the members was a sure-fire way to insure full paid staffing for the fire apparatus. When I got hired on at the department thirty years ago, Griff was the "old man" who oversaw all of the fire calls, many times staying with a burned out house through-out the night to make sure there were no re-kindles or missed hot spots, constantly smoking his Benson and Hedges cigarettes. This is what I remember - first morning cup of coffee at the station, planning out his day. Griff had been in a firefighting family, or married into one. His beloved wife Deloras was the daughter, granddaughter, and wife of a Bentonville Fire Chief. Thier son Scott served on the department for a time as well. As a side note, Deloras' mother Pearl Maples was crazy for the fire department. Her dad, husband and son-in-law were all on the department as just mentioned, and Pearl had a scanner or fire department radio that she took everywhere with her to monitor what we were doing all of the time. I took her in the ambulance to the hospital a couple of times and the monitor went with her. When she passed away, I was a pall bearer at her funeral. I often wondered whether she took the monitor with her...She was a faithful supporter. A visit to the Griffith house brings rememberance of jazz music and cigarette smoke, like their own little jazz club. They both enjoyed star-gazing and could name all of the major stars and constellations. A wealth of knowledge it seems. Griff also oversaw the addition onto the old station in 1980 and instead of three drivers, one for each shift, the department first had three per shift, then four when I arrived in 1982. He brought the city personnel with paramedic training, some of the first in the state, along with Springdale, Fayetteville, Rogers, and Bella Vista. 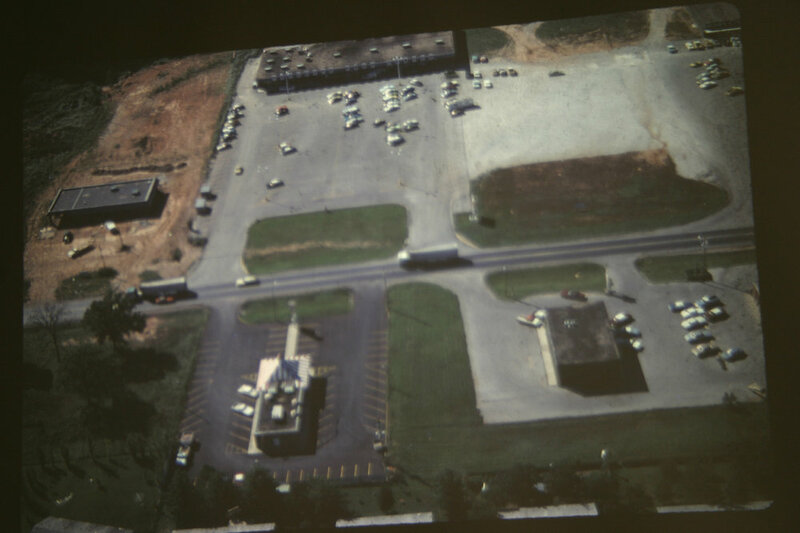 The addition of the ambulances helped secure not only a strong foundation for a fire department but also the best in medically trained personnel for the citizens of Bentonville and the outlying areas. For many years Bentonville was the only department in the county with rescue equipment and responded all the way to the Missouri and Oklahoma state lines for rescue efforts. When Rogers made a decision around 1980 to discontinue all ambulance service outside of its city limits, it was Bentonville that took up the slack, responding past the Rogers stations and out into the Beaver Lake area, a politically motivated move that was fortunately short lived. We now have a department with 60 uniformed personnel and six administrative personnel. What began as a hundred fire calls a year and maybe 60 ambulance calls per month has turned into nearly 5000 calls a year, from five station strategically located around the city, with a sixth in the planning stages. The last time I saw Griff was shortly before he moved to California to be closer to his daughter Nancy Griffin Volkins. It was about 2002 or 2003. I wanted to make it clear to him that he was what had made the Bentonville Fire Department into what it is today. He was instrumental in making me into what I am today, a thirty year employee, battalion chief, paramedic. His eyes teared up a little and he only said, " Thanks." Chief Griffith died February 3, 2010 in California. Deloras died a couple of years before, and, after a couple of devastating strokes, Griff could no longer remember where she had gone. I bring this up to remind everyone to remember where they came from. And remember where you are going. There is likely to be someone somewhere back there that gave you some direction. I am happy to say that Jerry Griffith pointed me in the right direction and I will always be grateful. Northwest Arkansas is a lovely land and all who go there fall in love with it. Large numbers of people are emigrating from Kansas and making new homes in Benton County and its thriving towns and cities. They are astonished as well as pleased on their arrival at the orchards loaded with delicious fruit until the trees almost lie upon the ground. Bentonville, the county seat, is a well built and properous city., the terminus of the Bentonville Railway, and is growing steadily. Yje new buildings going up, whether residences or business blocks, are a sure indication of the prevalance among the people of the spirit of enterprise, as they are in line with the advanced spirit of the age. A new three stroy bank and store building is in progress of construction, and a large evaporator will soon be in operation. The evaporator will have a large capacity and will create a market for thousands of bushels of the apples now ripening in that land of apples. The people are liberal, kind, and hospitable, and extend a hearty welcome to all strangers who come to make their homes and assist in the development of the country.